Who says representative democracy is deeply flawed? This blog first announced the terminal decline of representative democracy in May 2016. 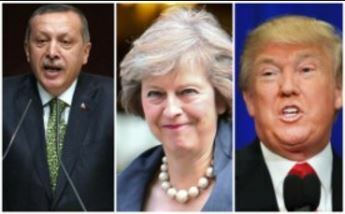 Since then, the EU referendum, Trump’s election, Erdogan’s referendum, amongst others, have enabled sizeable but minority intolerant inward-looking electorates to empower authoritarian-leaning leaders, promoting xenophobic and ultimately right wing elitist agendas. The expectations are Theresa May will ride a reactionary populist wave to landslide parliamentary success at the UK general election on June 8th. There are many reasons why this is a further nail in the coffin of UK representative democracy as a political vehicle for progressive social change. For the purposes of this blog, however, the focus is on the vagaries of who can actually vote in the impending parliamentary election. The Electoral Commission website gives the criteria for eligibility to vote in the General Election. The criteria for being registered seems unproblematic, until one recognises both the numbers of unregistered adults, and the differing registers for different types of election. The total number of over-18s in the UK in mid-2015 (the latest ONS data) was 51.3m. Based on recent trends, in 2016 this will have surpassed 52m. The latest (December 2016) ONS figures for the parliamentary electoral roll is 45.8m – so over 6m unregistered potential voters. For local government electors (which includes resident EU citizens and 16-17 year olds in Scotland) the roll is 47.4m – so at least 4.6m unregistered voters. Studies since the introduction of Independent Electoral Registration (IER) in 2014 suggests the unregistered cohort will be disproportionately in cities with large population churn, amongst young people, and those in the private rented sector. Manchester, for instance, did a major exercise on this. The city ‘lost’ 11,000 electors with the introduction of IER, and a further 14,000 from 2015-16 – amounting to almost 7% of the 2014 electoral roll. The city now has a post-18 population of around 420,000, a local government electorate of 356,000 and a parliamentary electorate of 346,000. The second criteria of particular note is the ‘over-18’ age requirement. There is really no sociological basis for this, and it has been superceded in Scotland with 16-17 years olds for local government, Scottish Parliament, and the independence referendum. One can argue the arbitrariness of 16 as a red line as well – but the over-18 cut-off does disenfranchise a further 1.2 million people – many of whom will be the most impacted long term by the public policy implications of these votes. For instance, had 16-17 year olds been enfranchised for the EU referendum, turned out and split like 18-24 year olds, the margin of BREXIT victory would have been well below 1m. The ‘advisory’ character of the referendum might have prevailed over the fascist interpretation of the result. A third ‘undemocratic’ criteria concerns the nationality of those eligible to vote. In general elections this is ‘British, Irish or qualifying Commonwealth citizen’. In local elections it is British, Commonwealth and EU citizens resident in the local area. The +/- 1m Qualifying Commonwealth adults is a very odd category for the general election. Virtually NONE of these countries (and even British Overseas Territories) have a right to residence in the UK, and some Commonwealth Members (e.g. Mozambique) do not even have colonial connections. On the other hand, the +/-2.8m EU adults are not entitled to vote nationally, unless they are from Ireland (+/-411,000), or from a Commonwealth Country (Cyprus – +/-31,000 and Malta +/-20,000). But they can vote in local elections. Had the EU referendum been held on the local electoral role (and let’s face it EU citizens were the most impacted cohort of electors), and had they turned out at national levels and split at, say the Scotland REMAIN majority (which is probably the very least they would have done), REMAIN would have won convincingly. Much as I am a supporter of the Commonwealth I can find no rationale for Cypriots and Maltese voting in the general election whilst their EU partner countries cannot; nor for Mozambicans having voting rights, whilst their Portuguese ‘mother country’ does not. Similarly, Fijians and Zimbabweans are eligible – despite both countries having been suspended by the Commonwealth in recent years. One can argue that voting eligibility is hardly amongst the most important signifiers of the breakdown of representative democracy as a political system for shaping social change in the UK. The campaigns based on ‘dark money’, promoting the lies and fake news of the non-Dom owned media and their political puppets is more pervasive and rotten. The levels of abstention and detachment from voting and political discourse is another. The centralisation of and by nation state oligarchs, and lack of profound, powerful devolution is a third virus at the heart of the democratic malaise. However, the voting nail in the coffin ought to be the easiest to fix – especially in the digital era. Residents should be eligible to vote, regardless of nationality completely. Voting should be extended to 16-17 year olds for all elections. The act of registration should be made easier and more immediate – to capture many of the 6m disenfranchised adults who are currently registered on reliable residence based public services systems (which is how ONS counts them in the first place). This will not prevent the June 8th massacre, coup or whatever other descriptor accurately represents these events. But at least it might provide the foundations for future meaningful elections with a semblance of inclusive citizen involvement. Posted in BREXIT, General election 2017, has it really come to this?, Voting systems | Tags: BREXIT, electoral rolls, General election 2017, has it really come to this?